As far as this batch of Blixasounds/Extra Term Audio (a company helmed by Dan Perloff, who also works with attorney Evan Cohen to help artists reclaim their masters), the gem is Stephen Bishop’s kind of obscure, jazzy 1980 Red Cab To Manhattan that includes its then-radio staple “Send A Little Love My Way (Like Always).” It would be nine years until his next US album release, Bowling In Paris but not that long until his post-“On And On” super-hit, “It Must Be You.” It seems obvious what happened to this LP during an era that ushered in new wave, new romantic, Europop, and punk. Many of the great singer-songwriters got lost in that musical shuffle, unable to get radio play after “Bette Davis Eyes” and an ensuing slew of electronics-filled singles and albums claimed every inch of airwave. It’s a shame, really, since Red Cab… was loaded with potential singles and Stephen Bishop was making records leagues above many of his contemporaries having hits at the time. In fact, Red Cab To Manhattan overflowed with creative talent in addition to Bishop’s. The album was produced by Mike Mainieri (jazz keyboardist/vibraphonist and Carly Simon producer) and the future King Of Smooth Jazz, Tommy LiPuma. It was engineered by one of the great, young, ’80s engineers, Scott Litt. Bishop pal Eric Clapton laid down guitar, Phil Collins supplied drums and percussion, and other studio biggies joioned the party, like Steve Gadd, Neil Jason, David Spinozza, Jeff Mirinov, Neil Larson, Willie Weeks, Hugh McCracken, Ed Walsh, arranger Gene Page, the ridiculously gifted, late Phoebe Snow, Bishop-material aficionado Art Garfunkel, and this list could go “on and on.” Ahem. 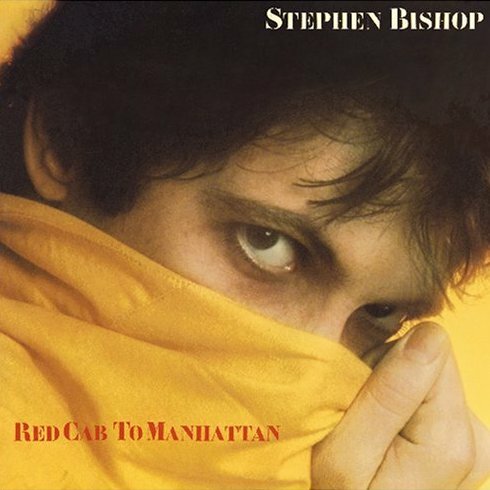 At the time, Stephen Bishop following-up his classic albums Careless and Bish with Red Cab To Manhattan was a natural next step as well as a testament to how much the artist had grown over the course of three LPs. But again, look at when it was released. On the other hand, there was one other path to the top ten (previously unmentioned here) thanks to Doobie Brother Michael McDonald, a route Bishop smartly never took with his Red Cab. Perhaps it was a label mandate of the time but “What A Fool Believes”’s keyboard approach was the backbone of quite a few hits, including those by The Pointer Sisters (“He’s So Shy”) and Robbie Dupree (“Steal Away”). What the listener instead gets with Bishop’s reissued LP is a nice mile-marker of a terrific career. Speaking of Robbie Dupree, the Blixa-ETA team also released his first two charting albums–the self-titled Robbie Dupree and Street Corner Heroes, the latter being the more interesting of the pair because of the growth the artist flaunts in his songwriting and performances. Sure, the first album has the hits “Steal Away” and “Hot Rod Hearts” but the follow-up album has more “Robbie Dupree” on it, although that freaking Michael McDonald keyboard lightly resurfaces on “Brooklyn Girls,” then more aggressively on “I’ll Be The Fool Again.” Well, it was 1981, so what was a singer-songwriter and his or her label that wanted airplay to do, huh? Ugh. Now, to be honest, looking at those Dupree albums, he really could have pushed his songwriting harder, especially given that the late Al Bunetta (the man behind the folk/singer-songwriter label Red Pajamas and John Prine’s manager) was part of the artist’s team. Still, they’re solid and they sold lots of copies, so there you have it. Let’s keep an eye on this Blixa-ETA entity thing-y and wish them well since it’s obviously going to stretch its legs with its releases, and they mean business having employed remastering veteran Bill Inglot and art designer and pop culture diva Lisa Sutton for the sonics and artwork that come in awesome, mini-LP jackets. These first titles and how nicely they’ve been treated are a sweet surprise for those who still buy/love reissues, and show a level of brave that some more established reissue labels don’t engage in. But with major labels having abandoned CDs for vinyl, now is a great time for a little licensing label like this one to cut through, marketing to an endlessly needy niche. Seems like only yesterday that a little label named Razor & Tie did something like that, right?